The project is divided in two parts: the "Car Backdoor Maker" (PC software) and "The Bicho" (hardware-backdoor for CAN bus). 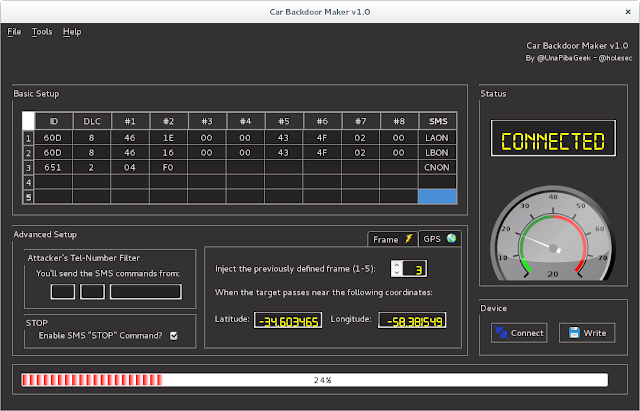 Under "car backdoor maker" folder, you'll find the source code to compile it using Qt C++ 5.6. 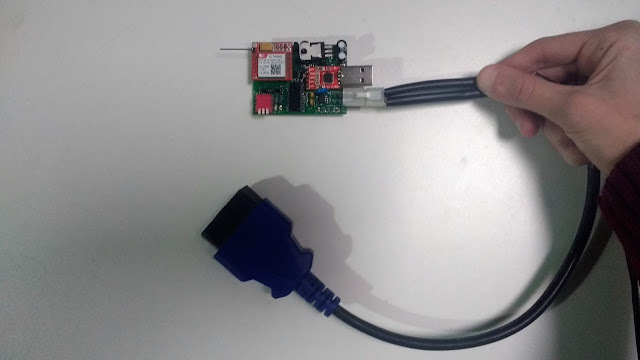 The Bicho is a hardware-backdoor that must be connected to the car's OBD-II port. It supports multiple attack payloads (pre-configured using Car Backdoor Maker) and it can be used against any vehicle that supports CAN, without limitations regarding manufacturer or model. Each one of the payloads is associated to a command that can be delivered via SMS, allowing remote execution from any geographical point. Furthermore, as an advanced feature, the attack payload can be configured to be automatically executed once the victim's vehicle is proximate to a given GPS location. The execution can also be triggered by detecting the transmission of a particular CAN frame, which can be associated with the speed of the vehicle, its fuel level, and some other factors, providing the means to design highly sophisticated attacks and execute them remotely. Under "hardware-schematics" and "firmware" folders you'll find all you need to build our hardware-backdoor in your own lab.